Three years ago, the first album on Andrea Parker’s new venture, Aperture Records was published. The work of Sheffield-born Nigel Truswell, released under the enigmatic name of Oberman Knocks, 13th Smallest was a particularly dense and abstract electronic record, sounding somewhat like a malfunctioning machine. With his second album ready to be released, once again on Aperture, we caught up with the man to talk about his formative years, rubbing shoulders with Autechre, Mira Calix and Andrea Parker, learning to get to grip about the technology he uses and the prospects of a collaboration which may take him onto a very different path. Nigel, it’s been over two years since your debut album, 13th Smallest was released. What have you been up to during that time? Well I’m one half of a graphic design studio called Pony, so that’s taken up the majority of my time. Other than that there’s been a few good trips to the States, some great parties (mostly in Dublin), I got married, took the dog out three or four times a day and in my spare time did the new album. What is your background, and how did you come to make music? What kind of music were you listening to when you were growing up, and how would you say it’s influenced your work over the years? I grew up in Sheffield, so I had a great wealth of music going on around me from many genres. At school I’d be listening to all sorts of stuff, from jazz funk, soul and Motown through to early Human League followed by electro and hip-hop. I was also learning the violin and viola, but gave it up because at the time I couldn’t relate it to the music that I was really getting a buzz from, so that’s where my formal music education ended. When I moved to London in 1988 I discovered loads of pirate radio stations, so then I’d be taping all the time, editing down and listening to tracks during the day at college. I’d say that was much more techno and hip-hop driven, along with interesting club/rave stuff. I also started hanging out down Berwick Street, which back then had some great record shops like Worm Interface and Sister Ray, where I’d be rooting through the racks and getting to know the staff, so I was getting exposed to lots of material both old and new that I wasn’t familiar with. In terms of the influence of sounds I’m not sure that anything in particular that I was listening to growing up has fed into anything I’ve released. I guess the biggest influence on me wasn’t so much a particular style, genre or artist, but more the DIY approach that came around when technology allowed people to start making their own music at home. I wouldn’t say that I’ve consciously aimed to produce a particular style of music, because I don’t really see the point in trying to emulate what other people are already doing. What I really relish is getting into a space and making sounds for myself. For me the final release is almost a by-product. If other people like it then that’s really an added bonus. 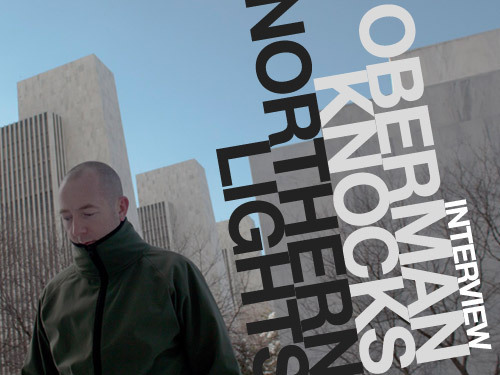 Although you record under a couple of other aliases and have published music on a few labels out there, Oberman Knocks seems to be your main project currently. How did it start? I felt like the tracks on 13th Smallest were a bit of a shift in terms of what I’d produced previously and because the album was going to be the first release on Aperture, I’d decided that I wanted to put it out under a different name. Oberman Knocks was originally going to be a title for one of the tracks on 13th Smallest, but for some reason I kept going back to it because I felt that it wasn’t sitting quite right with the rest of the titles. Then it just felt right as a name to record under. Your biography says that you ‘have no interest in tech talk, the latest plugins or trends’, yet your music relies heavily on technology I would think. What makes you view this aspect of your work in such a way? Do you think this has become a bit of a plague amongst electronic musicians nowadays, to compare patches, plugins or kit in general? I produce all of my work using technology – I couldn’t make what I do without it, from recording sounds digitally to processing them into other sounds and then forging them into an assembly of elements that make a track, but what drives me insane is that so many people want to know what someone’s using, and that becomes a real distraction from the actual tracks themselves. I’m not saying that it’s of no interest at all – of course it is to some degree – but you know there’s nothing more tedious than someone just wanting to talk to you about what plug-ins you use, as if that defines what you’re making. I know from people who get sent demos all the time that they can tell which are the new plug-ins or latest software because they become the dominant force in a lot of what people produce, which isn’t how it should be to my mind. After all you can take a piece of software and use it in your own way. It’s like if you give 100 people a pencil and a piece of paper, then ask them all to draw something, you’ll get back 100 things that look totally different. Not only will the style of drawing vary depending on how they hold the pencil and what pressure they exert on it etc, but some will draw in the corner, others will use the whole of the sheet and of course what subject matter they chose to draw will also play a major role in the outcome. One of the best pieces of advice that I got when I was starting playing around with sounds was to avoid jumping around with kit and software and to really try to get to grips with a couple of things, which I think has been really beneficial for me, because I’m still essentially using the same three pieces of software that I’ve always used and there’s still plenty of potential for me to push them much further. That’s not to say that I’m not going to try other production methods out at some point, but I make music as a hobby so unfortunately I don’t have the luxury of time to be learning new pieces of software, so there’s also a practical element to it. It also mentions that it was through Autechre’s Sean Booth and Mira Calix’s Chantal Passamonte that you were encouraged to make your own music. How did this happen? The first job that I had out of college as an Art Director was on a magazine. I had a great Editor, who I’d give out to about how bad the music reviews were, so she basically told me to write some reviews if I thought that I could do any better, and let her have a look at them. This was around the time of the early Warp years and I was listening to all this electronic stuff that was being released on new independent labels such as Skam, Markant and 555. So of course I called Warp to get on their mailing list, which is how I first came into contact with Chantal as she was their press officer at the time. About a year later I ended-up doing an interview with Autechre, and after that I’d see them at gigs, or if I were back up in Sheffield. Whilst I was chatting to Sean at a gig one night he said that he reckoned I should have a go at making my own stuff, mainly because I was quite definite in what I did and didn’t like. I’d fancied having a go for a long time, but that was enough of a push for me. When I got some sounds together I started sending Chantal and Sean tapes of tracks that I was playing around with, so that’s how it all got started really. Your music is quite dark and complex, built around complex rhythmic structures and post industrial soundscapes. Did you intentionally set out to create such a dystopian sonic universe when you started this project? Not at all. I just start off making sounds and the tracks evolve from there. I’ve always had a leaning towards what you might call dark music, and that’s what interests me in terms of production. What a lot of people perceive as being really bleak, others like myself find really interesting and stimulating to listen to. I do keep wondering if I have a happy tune in me though! Your first album was released on Andrea Parker’s imprint, Aperture. How did you meet Andrea, and how did you come to release music on her label? Initially I met Andrea through Mira Calix whilst we were out at a gig. At some point farther down the line she mentioned that she needed some design work doing, and would we (Pony) be interested, so we did a few jobs for her. At this point she didn’t know that I was making any of my own music, and it never really cropped up in conversation. Around that time I’d been asked to do a split release for a label who wanted to know if there were any artists that I thought would make for an interesting pairing, and I thought that it’d be good to see if Parker had any ideas, so I asked if she minded me sending her a couple of tracks to listen to. After her surprise that it’d never been mentioned it before, she said that she’d be happy to have a listen and off went a CD, with I think three or four tracks on it. A week later she called me up to say that she thought that I was mad to do a split release with the tracks and that she’d like to release them on her Touchin’ Bass label. I can’t remember how long I laughed for before putting the phone down on her. Anyway I didn’t really take it seriously to start off with, but then after a week or two Mira Calix called me and she mentioned how much Parker really liked the tracks I’d sent her. So then I started to think that she really was interested in doing a release. I called her back and said that I had other tracks on the go, and if she wanted I could send her some more to listen to, just in case there were some that she preferred to the ones I’d already sent, so off went another CD with six more tracks on it. At that point, having been a long time fan of both her work as a producer and a DJ, I was excited enough that she wanted to release anything, so when she got back to me and asked if I’d like to do an album as the debut release for her new label, as well as being flattered and surprised, I was of course delighted. When I signed to her for 13th Smallest I made it clear that I didn’t want to get tied into anything more than just the one album, as making music is something that I do when I have the time and feel like it, so I didn’t want to feel any pressure to produce anything else on demand. About six months after the first release we were at a party and she said to me “you do realise that you’ll do another album for me, don’t you”, and I laughed and told her that it was already on the go, so we’ve had an easy working relationship and become good friends at the same time. 13th Smallest was released in February 2009. Was it, like often with debut albums, the result of recordings collected over the years, or did you have a clear idea of what you wanted to achieve with it, and recorded with that to guide you? No it was a selection of tracks that I’d worked on over probably a two year period with no agenda other than producing material that I enjoyed making. Having said that once Parker had asked me to do the release I did put a lot of time into the final edit of tracks, their sequencing and gaps, and I wrote an extra track that I thought it needed. The vinyl version of the album only consisted of four tracks. Why was that? Both Parker and myself are vinyl fans, so when she floated the idea of releasing an EP from the album we decided that we’d go with tracks that would be more likely to be played out as well as something that vinyl junkies would like. So the 12” wasn’t intended as a version of the album really. Did the recording process for Beatcroff Slabs, your second album, differ a lot from your first, and how do you think it affected the music itself? Other than my old mini disc recorder finally giving up the ghost and having to switch to using a digital recorder, both albums are produced in the same way, using the same machine and software. You use some vocal elements in quite a few of your tracks, albeit in extremely processed form, often to the point where they sound everything but human. What is your intention when you use vocals? Is it something you’re interesting in taking further, and how? I like to use vocals in a way that tempers the completely machined sounds that I make. Although I listen to music with vocals I really enjoy listening to them when there’s no narrative there, so that the voice becomes more of an instrument as part of the composition. For example when I’m listening to something in a foreign language such as Le Mystère des Voix Bulgares, I have no notions of what they’re singing about and my focus is purely on the sound, because I’m not thinking about the lyrical content. Sometimes I’ll take vocal stuff that I’ve recorded and push it so much that it becomes more of an instrument if you like and vice versa. In terms of taking this further, Parker’s asked me to do a collaboration with her, where I take her vocals and produce an album using them as I see fit, so if that comes off it should be interesting. I’d love to work with the vocals of the Bulgarian State Choir, or maybe some weird rap artist and if Radiohead want to throw a remix in my direction I’ll happily have a go at consigning them into some dystopian realm! The music feels even denser on your new album than on your debut, yet there is also an increased cinematic feel to it. Was this your intention when you started working on it? I think that the denser feel is due to me locking down onto one track at a time and working it up much farther than I would have done previously. Generally speaking I’ll have about fifty sketches on the go at once, and after a while I’ll push some of them further, and then a small number of those get worked up into tracks. I’ve a terrible tendency to jump around on things, so I made a conscious decision to try working on one track at a time with this album, as opposed to four or five simultaneously. With 13th Smallest I was happy that a disparate set of tracks had hung together as an album, but they were all very much in a similar vein, so I decided that I’d like to try and broaden the spectrum sonically and structurally with this album, so there was much more of a conscious decision about producing certain types of tracks for sure. The cover for 13th Smallest was white with just the name Oberman Knocks and album title – very neutral and enigmatic. Apart from being grey, the cover for Beatcroff Slabs is very similar. Was this your choice? Is it a way for you to keep the focus on the music? To be honest a lot of that was driven by what Parker wanted the new label to look like. She wanted to keep the artwork for all the releases in black and white and she really likes very simple geometric forms. So when she asked us (Pony) to do the design I thought that it’d be better for my partner Niall to do the artwork for 13th Smallest as I wanted some distance from it. I really liked the type that Niall came up with, which was influenced by a gorgeous old record sleeve of a Beethoven recording I’d found in Prague, so I decided to keep the type and just modify it for the new album. So there’s some continuity there for the label to form a visual series as well. The album is due to be followed by a remix EP, with remixes from Plaid, Quinoline Yellow, Kero, Michna and more. How did you choose these people? Did you know them prior to this? Myself and Parker came up with the list of artists between us, because we thought that it’d probably make for a more interesting release, so we just kept throwing names at each other really. The first person I asked was Ed Handley from Plaid, basically because I’ve been a fan of his for many years in his various guises and roles as Balil, Black Dog and of course Plaid – who have also done some great remixes over the years as well as producing their own material. Ed really liked 13th Smallest, so whilst we were at a gig I asked him if he’d be interested in doing a remix from the new album. To be honest I thought that he’d politely decline, so I was pleasantly surprised when he said he’d be up for it. Michna had listed 13th Smallest in his top five albums of the year when it came out, so I’d sent him an email to thank him and consequently we had a couple of chats between us, so the next time that I went over to New York I decided to try and hook-up with him. When we met I just asked him if he’d be up for doing a remix after a couple of minutes chatting away, and again I was surprised that I got a yes straight back. Parker knew Quinoline Yellow, Kero and the Bitstream lads, whose stuff I really liked, so she asked them. Garret Phelan, who’s a great Irish artist and someone I’d always have the music chats with, was asking me about the remixes I was getting done and basically said that he’d love to have a go, so I thought that it was a great idea to have someone from more of an arts background contributing too. And I got the added bonus of an old friend Peter Maybury, who I did my MA with, playing live drums on his remix. An interesting thing about the remixes was that I decided to send the artists all sixteen tracks on the album and then let them decide themselves which track they’d like to work with, and they all went for completely different ones. Do you intend to perform live in the future, and if yes, do you have a good idea of how it will sound or look? I’ve been asked a few times to do a live set, and of course with the release of a new album people are wanting you to play stuff out, but I really need to spend time working out what it is I’d like to do and then find a way to actually perform it. I think that I’d be more inclined to maybe work with a film maker or theatre/dance company and work on something that’s different to what I’ve released. To be honest I have bit of a problem with the whole live thing. I find the whole nodding bod behind a laptop playing tracks exactly as they’ve been released with a bunch of visuals playing behind them totally pointless. I’m very aware that this has become the default for some artists, but to be be honest I wouldn’t feel comfortable with doing something like that. Essentially it would mean taking time out of work to develop a live set and that’s something that I can’t do at the moment, which isn’t to say that it won’t happen sometime in the future. Can you tell us about your other projects, and whether you intend to develop them in the future? Well my main project if you like is graphic design and so I need to put that first, but I’d certainly like to be in a position where I could maybe spend more time in the audio, so that I can push myself much further with that. At the moment the only other projects that are likely to happen are another solo album and the vocal collaboration with Parker, but who knows what might happen. Could you name five records, books or films which have marked you in some ways, and how? The Adventures Of Grandmaster Flash On The Wheels Of Steel – Grandmaster Flash. A record that completely shattered my notions of what a track could be when I first heard it. I think it’s quite difficult to explain to someone in say their twenties how radical this was when it originally came out. Blade Runner – Ridley Scott. Probably the seminal film when I was at art college that totally blew me away. I watched it again recently and it’s amazing how incredible it still is to watch. Autechre are still my favourite producers, who have delivered consistently on so many levels for me, and I have attachments to each of their releases for varying reasons, but Tri Repetae is such a great album that probably marks a point in my life that was full of new and exciting music that I was coming across. A Capote Reader – Truman Capote. The one book I’d have that I could read over and over would be this one. It’s a collection of work which has short stories, novellas, travel sketches, reportage, portraits and essays in it, and is such an incredibly interesting body of work. Sanq (Autechre Mix) – Cylob. Being a fully signed up atheist I’m absolutely adamant that I don’t want any kind of religious ceremony when I kick the bucket, and to date I’ve always thought that this track would be a perfect one for the service!